Writing about hunger today on April Food Day, inspired by Ari Herzog. His main concern is this charity, Feeding America. Although I have seen with my own eyes that also America has its share of extreme poverty, malnutrition seems to be a much bigger problem than hunger and with equally devastating short- and long term consequences. If you enter their homepage and click on the real-life stories, the pictures illustrate my point. A good deal of these people, apparently suffering from hunger, are obese. So, they are not hungry, but malnourished. I find that, from checking on their homepage, they don’t focus enough on nutrition and have no statistics to tell us whether it’s possible to buy enough healthy food for the family with the same amount of money that these families clearly spend on food with no nutritional value. Honestly, I don’t have anything to say on the subject of hunger that others haven’t already expressed much better than I ever could. So below I’m linking to a few filmed speeches (from TED) and posts/websites, which touch on this subject in original and intelligent ways. Enjoy! The first is Eleni Gabre-Madhin, who works for the International Food Policy Research Institute. On a much less optimistic note is an article from NYT about hunger in India – a much overlooked problem, because other parts of India are developing fast and it’s a democratic country. Hunger as weapon. Andrew Sullivan in the Daily Dish blog on the Atlantic. Really, really horrible! In the American Foreign Affairs magazine (often much more interesting than the title suggests) there’s an article by an Oxford economist, with whom I do not agree at all. He promotes large scale farming to solve the hunger problem, mainly in Africa. To offset his claims read the reply from employees of the World Bank. To eat meat or not, is that really the question? This is an absolutely brilliant post by a young PR wizard about technophobia. Particularly addressing privacy issues, something I often find myself discussing with people. This young man addresses it very well. It was Jesse Newhart who twittered about him. Google seems to be headed towards semantic search. Well explained on Mashable. Another PR guy who knows what he’s talking about is Brian Solis. Check out his blog. He’s come up with this model of how online conversation is taking place – if you look at the prism directly on Flickr you can see Solis’ notes by moving the cursor. Quite brilliantly done. Thanks to Gabs for pointer. Model from Brian Solis' Flickr page. I like watching 24 on the telly, it’s highly addictive. But I often think to myself that the show in almost every episode indicates that torture gives results, although all research shows that it doesn’t. People will say just about anything to be freed of the pain. This guy clearly hasn’t revealed anything of any interest to anyone, but that didn’t keep the US back from holding him imprisoned in Guantanamo for almost five years… it’s so embarrassing for the free world that we’re complicit in this! Quite a few Twitterers have pointed to Newswipe, a new programme on the BBC, and – having just finished watching it on the Iplayer – I must say it’s just fantastic! The middle part about the power of the PR agencies over the oh-so-slack media is saddeningly sobering. Likewise the last bit about a tiny demonstration, which was blown completely out of proportion by the media. News about one of my Most Hated Organisations. NRA. Obama, don’t let them get away with it! Do you love or hate chick flicks? A rather learned article on the subject. Including some depressing figures about women in the film biz. Oh, please give me something to do that doesn’t have a downside to it? The newest environmental fad, which I’m also following, is to eat less meat. An article on BBC News tells me that that’s not an altogether good thing to be promoting, since people in the developing world need the protein they get from their livestock. The article is sort of made to look like there are two conflicting views here, but I don’t really think there are! No doubt all of us in the West could benefit from eating less meat? Healthwise and environmentally? That doesn’t mean we’re aiming at stopping African herders from eating their cattle!? Come on! How the brain tends to switch off completely when put in front of a so-called expert. Avoid them, I say! Ever wondered what’s on the other side of the planet? Literally? Wonder no more. For me? Ocean. Pointer from Sheamus. Scientists are getting closer to finding the cause(s) of the demise of the honey bee. Good news, eh? Then we just need to do something about it! How do you keep people interested in green initiatives and saving the environment at a time when people are concerned about their jobs? That seems like such a silly thing to ask, when the vast majority of things you can do yourself for the environment is about being frugal? The article is interesting enough though, since it tries to answer the overlying question, which is whether there’s political will in a time of recession to invest heavily in the environment. Growing hemp could be one of the answers to Newsweek’s question. Where not otherwise indicated the above links are found via my own RSS feeds or via the busy, busy Nerdnews on Twitter. Udgivet i marts 26, 2009 Kategorier blog, blogging, feminism, food, health, politics, science, TV, Web 2.0Tags blog, blogging, credit crunch, Earth, frugal, Guantanamo, hemp, honeybee, links, Newswipe, NRA, politics, PR, science, source criticism, torture, TV, Twitter3 kommentarer til To eat meat or not, is that really the question? Had nice Mother’s Day with flowers – hand-picked at real florist by young son – and womenly presents. It was an incredibly beautiful day, so we went to Box Hill, the highest vantage point here in Surrey bringing a picnic. We had a lovely time and even got some much-needed exercise walking up and down the hill. In the morning I favourited a huge number of tweets and bookmarked an even bigger number of news from my weekly dosage of science news. All at your disposal. This is really good news: The US is completely reviewing and changing its policy towards the poppy-growers in Afghanistan. Lead came from @howardsend, who generally tweets very interestingly. The populist blah blah blah about youth today and elevated murder and crime rates is just that. When the real pros dive into the statistics, a totally calming result emerges. But that doesn’t sell one single copy of the Daily Mail and doesn’t win over voters. A stranger is better at predicting what makes us happy than we are ourselves. See that’s interesting! The study was led by one of my heroes, Dan Gilbert. I’m always trying to get people to read his book. Botox hinders happiness… Ah, well, sort of. If you don’t show your disgust over something but try to hold it in, the disgusted feeling will stay with you longer. People who’ve been botoxed can’t show disgust – or any other emotion for that matter. Stephen Fry is one of the most popular celebs on Twitter. I’m not following him myself, but I see the occasional ReTweet and I have also visited his page. He is funny, there’s no way around it. He’s given an interview to BBC’s Radio 4 about why he looooves the web. It’s good. He says things some of us dare not say, we just think it. That’s a relief! Here’s a quick run-through of a panel discussion about the future of the music bizz held at SXSW. These bizz people were clearly well chosen, because here’s people thinking out of the box and not shooting at everything that moves from copyright trenches. Tips for Facebook power users. There’s even a tip that tells you how to return your Facebook page to the old look and feel before THE CHANGE. If you so wish. Twitterer Lulu has made this cute little Twictionary over the strange words you encounter once you’ve entered the realm of Twitter (AKA the Twitterverse). Speed up Firefox. Wauw, I needed that piece of info! Thanks to The G Man. An interesting list of influential people in the tech world. Nothing to do with money, I should add. Link from Sheamus Bennett. A huge study (from the US) seems to have proven that blacks actually get cancer more than whites. Even if I can see that they’ve done a lot to eliminate other factors, I still wonder if this would also be true if the comparison had been made between white Americans and Africans (in Africa) with same demographic and social characteristics. The language of music is now proven to be universal. Must admit that I would have been more surprised if it wasn’t. Here’s a really odd one – of the archeological sort. A study of 500 year old teeth reveal which bodies in a gravesite on La Isabela belonged to sailors brought there by Columbus and the interesting fact that some of the people buried there were almost certainly from Africa! The fatter the parent the less he/she is able to see a weight problem in own offspring. Maybe not surprising, but still? How can you fail to notice that your daughter’s legs are twice as big as the other girls’? And that your son needs shirts for grown-ups even when he’s same height as the other boys in his class? My father-in-law (80, super-fit, very healthy) has been eating after the GI diet principles for many years (1/2 plate: veg, 1/4 plate meat/fish, 1/4 plate rice/pasta/pot./etc.). Apparently one of the reasons it works is because a diet low on GI will make you feel more full. Makes good sense. Am trying to buy more veg and less meat already, inspired by Mark Bittman. My husband sometimes angers me by salting his food before he’s even tasted it. I’m showing him this article about how a very slight reduction in daily salt intake significantly reduces your risk of heart deceases. More evidence that it’s highly hereditary. Parents grossly underestimate the influence their children have on them when grocery shopping. Well, I don’t. Which is why I generally avoid having any of them with me when shopping. The 20-year old is worse than the 7-year old! Viva music! The combination of children and music is good. Always. Never underestimate it. I’ve written about it before, here and here. And now there’s a new American study, showing that children who learn music also enhance their cognitive skills. On a much related note: It’s harmful, particularly to men, to be angry and aggressive. It being Mother’s Day tomorrow, the Times has asked six women, mainly writers, to write a letter to their children at 21 (they all have young children) or to share the advice of their own mothers. Some of these letters are so, so beautiful. I didn’t just well up, I had to go and get a clean hanky out of the drawer. I like Sarah Vine’s and Justine Picardie‘s the best. Found on Tania Kindersley’s brand new blog. The Times has also compiled a list of the most powerful Muslim women in Britain. An interesting read! Olivia James writes a very poignant piece about Mother’s Day. Read it if you have a troubled relationship with your own mother! Hugh Fearnley-Whittingstall has a weekly food column in the Guardian. If it wasn’t online I’d feel compelled to buy the paper every Saturday. Actually, I might do that anyway, the Weekend Guardian is a very good paper, lots of sustenance! Today it’s about flour. Also one of my pet causes. I buy almost all my flour freshly milled at the Farmers Market, not least the lovely spelt. It’s a totally different experience from the supermarket stuff. Hugh forgets to mention cornmeal – not the dreary stuff that you buy to thicken your gravy, but the real stuff. I use it in muffins, which then look beautiful and yellowish and as one of three types of flour in my sourdough bread. Sourdough bread & cake with muscovado sugar, cinnamon & courgettes. Cut the bread (preferably stale) into bite-sized chunks. Mix all “wet” ingredients and toss the bread chunks in this. Mix all ingredients. Don’t serve cold. Also in the Guardian, Ben Goldacre again crucifies a number of journalists for their faulty and misleading interpretations of a scientific paper about prostate cancer. I’ll never stop recommending TED. Probably the best source of ideas on the web. It never, never fails to inspire and to lift my spirits. Here’s about how to grow your own fresh air… What to do when you DO NOT have green fingers? A lot of people are – as usual – angry with the new design of Facebook. Maybe I’m easy, but I’m fine with it… Here’s one who doesn’t like it, but makes a good joke of it. Here are some very useful tips about how to customise the new Facebook. I’ve already done it – I have some FB friends whose updates are rather boring, to be frank. But I still want to keep them as friends. Done! I don’t find any reason whatsoever to doubt this story about the GRU and the FSB in Russia using cyber “weapons” against Georgia in the war. But then I’m not a great fan of the Russian Leadership. Oh yes, and as an Iphone owner I’m thrilled to bits by this. Can’t believe I forgot to write about it earlier! An American soldier tells the moving story of when he accompanied a fallen soldier to his final resting place. Very touching and also enlightning. The Americans are good at honouring their fallen. Would be nice if they were as good – or even better – at honouring the wounded and crippled. Here’s about the methods of torture applied by the CIA. You know, the ones sanctioned by John Yoo, as mentioned yesterday. This sounds like a good plan. Geithner reveals how the US will deal with its toxic assets. See, here’s what sets a respectable Republican apart from one you can’t respect. Please Sarah Palin, can’t you just go elk hunting forever? How can this and this take place in the same country at the same time? It’s about the right to life on the one hand and the right to a dignified death on the other. With a few exceptions, which are from my RSS reader, all of the above were harvested over 24 hours on Twitter. So don’t tell me twittering is a waste of time. Undo – it's doable now! Were you in favour of the war in Iraq? Check Bush’s “entry” speech here. Andrew Sullivan is embarrassed that he fell for it. I would be too! I’m proud that my sister and I actually took part in an anti-war demonstration – none of us being people normally given to demonstrations. Bush has no regrets, apparently. Bush’s legal councel John Yoo, who wrote the infamous memo that “allowed” torture, isn’t either. Read about it here. Obama made an appearance on the Jay Leno show. That’s a first. He managed to make a blunder and had to apologize profusely. Why is it that nobody seems to be able to take an innocent joke for what it is? An interesting post about why we (yeah, well, some of us) so urgently feel the need to share our thoughts with others. Microsoft tries to explain what their new privacy settings are for. It’s close to funny. Kottke.org has this interesting story about how much revenue the “was this review helpful to you” question on Amazon generates. If you have heard or read any tech news today, you already know this, but here goes anyway. A Godsend to every Gmail user. Now you can un-send your messages – as long as you’re quick! Why am I not surprised? (Why alcohol makes you feel good). Udgivet i marts 20, 2009 Kategorier blog, blogging, health, politics, TV, us, video, Web 2.0Tags alcohol, Amazon, blog, blogging, George W. Bush, Google, iraq, links, Microsoft, politics, TV, video, writingSkriv kommentar til Undo – it's doable now! What can Google do for God's reputation? There’s something about women’s rights out there every day. Even when you’re not looking for it actively. I don’t subscribe to any “feminism” blogs or sites, because, quite frankly, they often bore me. That doesn’t mean that I’m not supportive of the “cause” or that I necessarily disagree with a lot of feminism issues – it’s more that it’s so difficult to find the right balance between our “luxury” problems here in the Western world and the severe plight of women in the Third World, particularly the Arab world and Africa, where AIDS is hitting the women very hard. This one I found on Twitter (twittered by a man, I should say). It’s about how Arab middle class women are using the web as an important tool in their struggle for freedom. The truth always comes out in the end. The question here is of course whether the responsible will be brought to justice or if it’ll be like at Abu Ghraib, where only the foot soldiers got to pay the price. I suspect the latter, unfortunately. In the National Security Journal they dare to ask the Big Question. Pointer from Andrew Sullivan. Check this great blog with the fantastic title Freerange Kids. Here’s the Times’ Schoolgate blog’s take on the story I had the other day about children’s lunch boxes and what ought and ought not to be in them. Also on Schoolgate this heartfelt post about birthday party bags. I couldn’t agree more! All I can say is YES YES YES! It’s not homemade food with butter, cream etc. in it that makes the world’s poor fatter and fatter. It’s processed food. How often must we say this? You won’t believe this. Google wisdom applied to religion. Udgivet i marts 19, 2009 Kategorier blog, blogging, children, feminism, food, health, politics, women's rightsTags blog, blogging, children, family, Gaza, God, Google, Israel, links, politics, school, TwitterSkriv kommentar til What can Google do for God's reputation? I’m afraid you’ll see many posts from me in the future looking like this. Since I started twittering I just seem to come across even more interesting things than ever before. What about this kid, who donated his birthday presents to children in the Third World? More about children online. When reading this, please take into account who paid for this survey. Symantec. They want us to worry. But I still think it’s true that our children spend more time online than we’re aware of. The advice in the article is good and precise. Why you (don’t) need Twitter. It’s funny. Very Twitteristic: How to ReTweet better. Good idea. Watch whom you trust with your online security. Fantastic Firefox plugin that shows just how far we’ve come on the web. Thank you to Gissisim. A mother is reported to the police for letting her 10-year old walk to soccer practice. OK, this is in the US, but still? This would be laughable if it weren’t so tragic. In a recession, equal pay is unthinkable. I wonder what else is unthinkable in a recession? Some Republicans have understood what the majority of Americans were trying to say when they voted for Obama. Others haven’t. Black women entering the White House in unprecedented numbers. Don’t get smart with us, Dicky, says Obama press secretary. EU is rasing the bar on climate change. But not for us. For “the others” (=developing world). Shame on us! Best medicine at cheapest price. Conservative Americans claim that this is “European” – i.e. socialist practice. Read the interesting discussion, fuelled by a post in Obama’s stimulus package to fund research in this area. Passing it on. Possibly the brightest kid on the planet right now. I’m glad he’s not mine. Not sure it’s a blessing! I’ve been ranting about this before, but here I go again, inspired by the below sign permanently posted at the entrance to the shower area in my gym. No cleaning is actually going on or has been going on when the sign is posted there. I don’t have a problem with that – it’s absolutely nice and clean and the cleaning person does her job very well. No, obviously the sign is there to warn the patrons that the floor is wet. I’m sure it will come as a great surprise to many people who are going for a shower at their gym, that the floor might be wet in that area. Why is it that we need to be warned and advised about the most ridiculous things, when, just to mention a few examples, cars can drive a lot faster than the speed limits and cigarettes and alcohol can still be purchased? All things that cost a lot more lives and a lot more money to society than a person slipping where it’s wet or falling off a tree branch. It’s double standards! I would like to regain responsibility for my own life and then maybe the authorities could spend more time and money on real dangers, that we as individuals can’t do anything about, like greening everyday products, protecting the honeybee etc. etc. I sound like a libertarian now, I know. But really, I’m not a libertarian, I pay my taxes with (relative) joy and am in favour of many kinds of regulations. It just seems to me that some areas of regulations have gone completely overboard, particularly some of the health and safety regulations. The fact that so many people know so little about food and cooking that they’ll eat a chicken that’s practically raw is not something we should regulate our way out of. It’s something we should educate ourselves out of! At the time when Obama’s package was coming together, I looked high and low for an alternative. All the republicans could say was: Lower taxes. Here’s a speech now, which is hailed as the Republican Party’s response to the rescue package – why they voted no. It’s delivered by the Louisiana Governor Bobby Jindal. A word of warning – I haven’t counted (don’t have time), but I do believe he says “Americans can do anything” more than 20 times… The above Youtube video is only the first part of the speech. If you’re not completely nauseated when you’ve sat through that bit, jump to Youtube to see the other half. Notice his interesting reference to Hurricane Katrina (he is from Louisiana, after all). Bureaucracy was why the help went haywire, he says. Hm. And then there’s the ever-present tax cuts. The Republicans cut taxes for eight years, consistently. Example: Those who made $1 million/year got a tax relief of $53,000. And those who made $20,000 a year got a $375 tax relief. When Bush came into office, it was with a $237 billion surplus. When he left, it was with a deficit hovering around $1 trillion. Only after 10 minutes does governor Jindal acknowledge that the Republicans didn’t quite live up to all his blabber, when they were in office. But that’s HISTORY now, he says. Now the Republicans WILL cut bureaucracy and government. And they will work towards bi-partisanship, as long as the Democrats will cut bureaucracy and government. I wont comment on what he says about the American healthcare system. Listen to it yourself… Towards the end of the speech he says something else that sounded a bit strange to my ears. He said “Americans won the struggle for civil rights”. ‘Scuse me, but since it was a STRUGGLE and since no other nations were involved, it must have been some Americans who won over some other Americans? After months of hesitation and no-saying to Twitter I’ve given in. As I understand it, Twitter can be more useful than Facebook when you want to promote your blog and/or other writings to a larger crowd. And of course I want that – otherwise I wouldn’t be writing, would I? I’ve read up on Twitter recently, here and here. There are a few things that irritate me about Facebook, although it’s also fantastic to re-connect with old friends and acquaintances. Funny how some people who used to be mere acquaintances are now candidates for friendship and how some who used to be friends, now have come off the radar, somehow. If you want to follow my Twitter feed, my screen name is labeet. Completely unrelated – I’m happy that Slumdog Millionaire (which we accidentally saw Saturday afternoon!) won lots of Oscars – it’s a great film. Happiest I think I am for the music score Oscar, since I particularly liked that. Very original and very in-your-face without obscuring the film. Also it’s great that Anthony Dod Mantle, who’s a little bit Danish, haha, won an Oscar for the cinematography. He is good. Tonight my friend Irina Lankova plays Beethoven’s 3rd piano concert at the Royal Holloway. I’m so excited and also nervous on her behalf. While waiting to be picked up for an afternoon out with my sister-in-law before the concert, I checked Boing Boing. Should do that more often. Always some hilarious postings. Check this about Obamania in Japan and this about yet another corny American museum. Not so funny is this post by historian and liberal blogger Igor Volsky about how misinformed you are if your only news source is Fox News. is another word I like a lot. My dear old Dad, bless him, has often said that the word procrastination defines him. I think that’s rather unfair, really. Except for the Mr. & Mrs. Perfect out there, we all do it! So there goes, Dad, I never bought it! Although I in fact have been really efficient today I started the day procrastinating. While David took Dane to school, I browsed through the news over coffee and stumbled over a couple of odd pieces. I managed to control myself and NOT start blogging about them first thing, but to DO WHAT I HAD TO DO first. Which was homework for my last course of this my last semester of my BA in library- and information science. The course is about building large websites (=corporate portals) and is quite techie, which suits me just fine. But because academia is academia (can’t think of a better explanation, sorry!) most of the texts are 7-8 years old. Which is perfectly OK if your subject is ancient runes or hieroglyphs or even if it’s WWII. But I just find it very, very hard to believe that the best stuff available about the building of portals and content management was written 7-8 years ago! Less than two weeks before leaving office, Bush made sure the senior aides shared a new assignment, naming them to an obscure World Bank agency called the International Center for Settlement of Investment Disputes. One of the Guardian blogs has a very thought provoking post about what to do with that Afghan fellow, who’s clearly guilty of something, but who’s been tortured so badly that he’s been reduced to a head-case? The post is by seasoned Guardian journalist Michael White. Those of you who know me personally will probably know that I was always a fierce advocate of the MMR vaccine. A “scientist” published a paper linking the MMR vaccine to autism. It was just the one paper, but it had all the ingredients of A STORY in the press. And it became huge. Suddenly everybody knew a child with autism who’d had the MMR vaccine. The fact that ALL children back then had the vaccine, also children with autism didn’t get in the way of this scaremongering story. When it was revealed that the “scientist’s” data were falsified and that there is NO link WHATSOEVER between the MMR and autism, this wasn’t at all A STORY. So there was nothing, or almost nothing, about this in the media that people actually read or watch. Which led to a huge drop in children who’d had the MMR. And now we see the result. A veritable measles epidemic. Try reading about measles and think that if it hadn’t been for that “scientist”, but primarily if it hadn’t been for the media who never seem to take responsibility for anything, all these children and teens wouldn’t have to suffer the dreadful complications to measles. The illness would most likely have been extinct! Here’s the story from the Sunday Times. Sunday morning I read an article (no, not an article, an excerpt from this book) that truly scared me. The writer James Lovelock states that we’re too late to save the planet, so all we can do – as Brits – is to save ourselves from the hungry hordes, fleeing their over-heated or flooded homes! It came much too close to the article about the honey-bee I read only a week previously. Have we really come to the brink of our own extinction? And why are we all sitting back doing next to nothing? Probably because it’s just too much for our brains to handle! What I found even more scary than the prospect of living on a diet of strictly local produce and not enough of it in 2030, was his suggestion that we need a “strong leader” like Churchill to guide us out of this mess – democracy is no good in such dire straits. I shiver to even write it! On a less dire note, here are some recent tech news. Amazon has launched a new version of the Kindle. I still want one and I still can’t have one. There’s no news about when this lovely gadget will be available in Europe. It’s something to do with the difficulty of finding an agreement with our multiple phone companies. Hmfff. I want it soon, and so, I think, does my husband. Look here how many books I’ve bought inside the last 3-4 weeks. Admittedly some of them are for course work, but as you can see, not all of them! Which one should I start reading first? Don't say Jakob Nielsen, please! Here’s a funny one – I bet my oldest son will like it. It’s about bragging of your World of Warcraft skills in your resumé… I would say it depends on the job, really, if it’s a good idea or not! Speaking of games, here’s an odd piece. I don’t play myself, so the thought hadn’t even occurred to me. But of course – in games that are so life-like there would have to be pregnancies. And it’s fun to read how they go about the deliveries etc. Thanks to Torill for the pointer. I subscribe to a rather charming newsletter about digital photography and related subjects called Photojojo, recommended to me by a family member, who owns this site. Today the Photojojo newsletter had a very cheerful and Fridayish story. A geek who’d left his computer behind and had gone hiking found a Sony digital camera at the bottom of a river. It was completely rusted, but the (self-confessed) geek took it home to see if he could rescue the memory-card and thus maybe return the photographs to their rightful owner. He made a blog about it and after only one week, the rightful owner was found. See that’s a nice story. There are actually kind and considerate people out there, isn’t that nice to know? It turns out that there (why didn’t we just guess that?) is a website dedicated to finding the owners of lost cameras/photos. See it here and make use of it if you ever find a camera or buy a “new” memory-card with pictures on it, as apparently a number of people have tried. Another random note comes here: A really good search tip, which as an almost-information pro I should have known, is that you can use Google’s superior search to find stuff on large websites with less superior search functions. Read about it here in PC World. I WARMLY recommend it. I quickly tried to do a search on PC World itself both ways. It works miraculously! Here’s a story from Financial Times. I don’t know whether it should make you laugh or cry. It’s about a host of abandoned luxury cars in Dubai’s international airport with keys in the ignitions and maxed out credit cards in the glove compartments… The pointer came from Marginal Revolution. As I’ve mentioned previously Alex Tabarrok from Marginal Revolution is a TED speaker this year. He tells about his experience and also brags a little (I would too!!!!!!) about having met and talked to Peter Gabriel. He recommends Gabriel’s website, which empowers the powerless, Witness. One of the three TED prize winners was a person and a project that I’ve previously written about here. José Antonio Abreu and his El Sistema. Briefly explained, El Sistema uses music to drag poor children out of poverty. It originated in Venezuela, but has since been succesfully exported to other countries. I can only approve. LOUDLY! Viva Music! is a song I hate. It’s so playing up to the little man’s envy or whatever you call it. But that was what I thought of when I read this article in the Washington Post. 18 billion $ have been paid out to Wall Street financiers over the last few months. In Merrill Lynch, the article tells us, where bonuses are usually paid out in January, they hurried to pay out 3-4 mill. $ in bonuses in December, before they were taken over with billions in debts. That’s 9 zeros. 000000000. Or 000.000.000. In sterling that’s around 5.6 billion. Let’s split that up in brand new cars. Brand new envy-inspiring cars. Are you ready? App. 307,000 of these lovely cars. 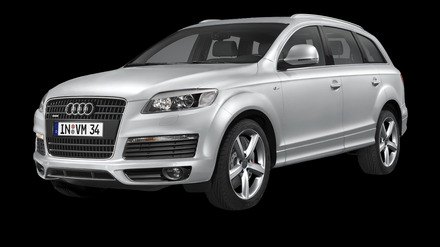 I don’t even think Audi produces that many Q7s! (They are around 41,000£ each). Hm. That’s still too big a number to really sink in! Let’s try with houses. OK. The above house sells at £2,1 million. Let’s say we get it at the bargain price of £2 million. So the Wall Street guys – don’t know exactly how many people split the 18 billion, but a safe bet is that it’s definitely more than one Audi per head – can get 6,300 houses like this. I’m actually not at all against bonuses and rewards for high performances. What I’m deadset against though is when bonuses are paid for doing an appallingly bad job or for serving the share-holders’ short term interests (which are sometimes not at all beneficial to the company) rather than the company’s AND the shareholders’ long term interests. I hate protectionism! It never seems to do any good to anyone, but the unions love it and the voters seem to love it too. I find it incredibly short-sighted to “buy British” to keep British workers going in industries that are clearly not competitive. Why not teach these people new skills instead or revamp the businesses so they can get on by themselves in the world. In Denmark protectionism has always been favoured to help the farmers and the ship yards. In the end they had to give up protecting the ship yards because it became ridiculous to keep pouring money into it when ships were built much cheaper in other parts of the world and giving people there jobs, who did not have access to any kinds of benefits or to learning new skills. Unfortunately the same thing cannot be said about the farmers, who are still being massively subsidised by EU. I Buy British when it’s fruit, meat and vegetables of good quality, because I believe that the shorter distance these foodstuffs have covered on their way from the good earth and onto my dinner table, the better for the planet. It’s certainly not to protect British farmers. If they can’t produce something of quality at a fair price I’m not going to buy it, not if he’s my neighbour! Anyway, that’s what all the talk has been about in Davos today – read this summary of the protectionism discussions in Washington Post. On an entirely different and quite silly (but cute) note, here’s something a friend sent me today. Be patient while the page loads, it takes a little while. And then move your mouse around. And, not least, try holding it still. I’m glad that yet another mystery of “how things work” has now revealed itself!